Jon Armstrong, author of Grey and the forthcoming Yarn and Loom, is the leading and perhaps sole practitioner of the new genre of FashionPunk. 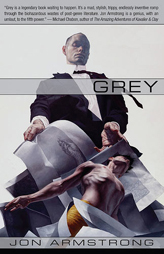 In Grey, which I just finished reading, the main character and much of society are true dedicated followers of fashion, building their lives around their anthemic magazines and music. Armstrong takes this concept and pushes it with vigor. Fashion is the lens through which the main character sees the world. Maintaining this fashion-centric viewpoint is one of the most admirable parts of this admirable book. Yarn, which is, I believe, set before Grey and features a minor character from Grey, is up for pre-order at Night Shade’s website, and Night Shade is currently running an offer of half-off current books and pre-orders, So this would be an excellent time to pick up some great books.